EnGenius is known for its broad line of relatively inexpensive outdoor wireless bridges. I previously looked at the 2.4 GHz only, N300 class EnGenius ENS200 in January 2013. In this review, I'm going to cover its 5 GHz only sibling, the EnGenius ENH500. Physically, the ENH500 is housed in a gray plastic IP55 waterproof housing measuring 3.31" W x 10.24" H x 2.17" D. There are screw holes on the back for mounting the device and a mast-mount strap is included for pole mounting. The front of the device is shown below. The images below show the rear and bottom of the ENH500. Notice that the signal indicator LEDs on the rear of the device are not visible once it is mounted, so they're of questionable use. The bottom image shows the two 10/100 Ethernet ports. 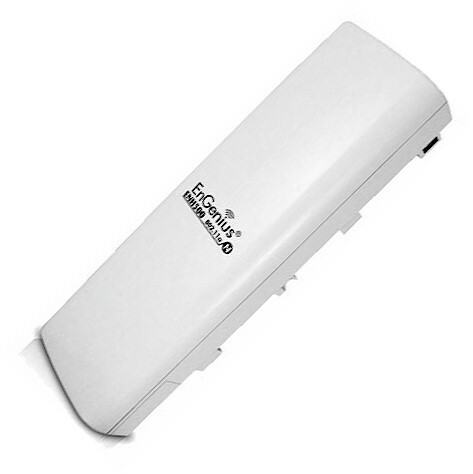 It is interesting to note that the EnGenius advertises the ENH500 with a max data rate of 300 Mbps, but with only 10/100 Ethernet connections, you're going to be limited to 100 Mbps for any connection that goes from the wireless network to the wired network. We'll see in the Performance section that the 10/100 port does in fact limit maximum throughput. As with the ENS200, the ENH500 is powered by a proprietary Power over Ethernet (PoE) adapter, which is included. According to the ENH500 manual, "The ENH500 uses a proprietary PoE injector and will not work with standard 802.3af-compliant PoE switches." The ENH500 specs say it draws 9 W, which is easily within most PoE switches' per port PoE capability, so it seems odd EnGenius has designed these devices to work only its proprietary PoE adapter. This is probably to save cost. Also like the ENS200, the ENH500 has an operating temperature range low of only -4ºF. So be advised if deploying this device in a climate where sub-zero temperatures are possible during winter months. Located on the main board of the ENH500, shown in more detail below, is an an Atheros AR9280 single-chip 2x2 MIMO 5.0 GHz radio, as well as an Atheros AR7240 wireless network processor with a 400 MHz CPU, 32 MB of RAM, and 8 MB of flash. The AR7240 is the same chip used on the ENS200. The feature list below is compiled from EnGenius' ENH500 data sheet and specifications.